Having been closed since the December 2011 death of Kim Jong-il, the Kumsusan Memorial Palace of the Sun has recently reopened, and along with refurbishment and new displays, the bodies of Kim Il-sung and Kim Jong-il are now available for viewing. 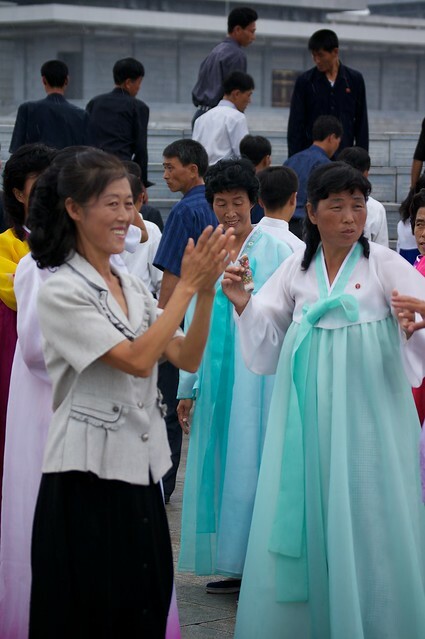 North Koreans outside the Kumsusan Memorial Palace of the Sun. My 2011 visit to the mausoleum was the most surreal thing I have ever done. There is a deliberate awe inspiring buildup factored into the paying of respects at the body of Kim Il-sung. On entering the complex one is subjected to multiple security checks, cameras are confiscated, cloth booties are issued to be worn over the shoes, and you are forced to ride kilometers of moving walkways into the marble encased heart of the complex. 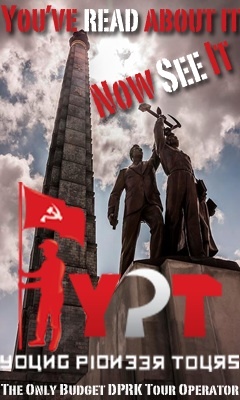 From there you are marched around in groups, disorientatingly led from room to room, and forced to bow to various Kim Il-sung statues, all the while listing to an audio account of how the laws of nature were broken on the day of Kim Il-sung’s passing – upon his death the people cried with such emotion that their tears crystallized into diamonds in the pavement. Before entering the holy of holies for the finale of bowing to the body of Kim Il-sung (all visitors will be expected to bow as a sign of respect – to go this far and not do so would cause a MARJOR incident), everyone must pass a through a bank ultra industrial sized air blowers, removing all traces of lint or dust to ensure no possibility of contamination. You will be expected to bow three times, once at Kim Il-sung’s feet, and on his right and left side. Authorities take your picture as you bow – the perfect little memento for your permanent secret record and always available for review by authorities if questions concerning your respect for the Eternal President become an issue. If you can imagine how surreal all of this is for visiting foreign tourists, think about how overpowering the experience must be for a North Korean visiting for his first time from the provinces. A visit to Kumsusan Memorial Palace of the Sun is the ultimate in propaganda showmanship; there is no other place or experience like it in the world. I assume most of the procedures described above will continue with only slight changes to accommodate the paying of respects at the body of Kim Jong il (it is reported that he is placed at rest in a glass display next to his father). Viewing of newly created displays showing Kim Jong-il’s yacht, his medals and awards, and even the train car he died in will also be include in the visit. 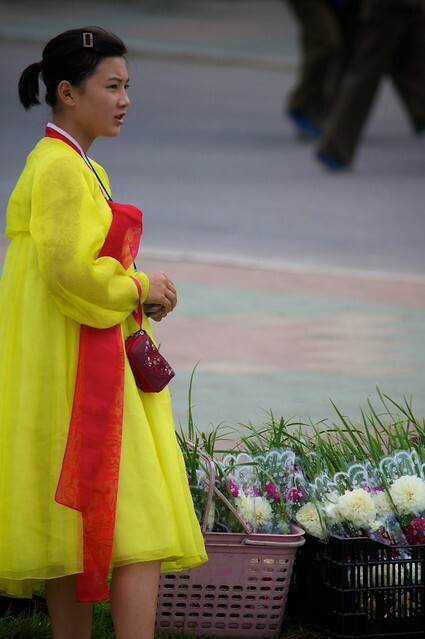 A flower girl at the Kumsusan Memorial Palace of the Sun. Tourist trips don’t start up again until mid January, until then I will be eagerly awaiting the firsthand accounts of those who make the first visit to the newly opened mausoleum. Sunday morning visits to the mausoleum have already been included in the schedules for my two custom spring trips. 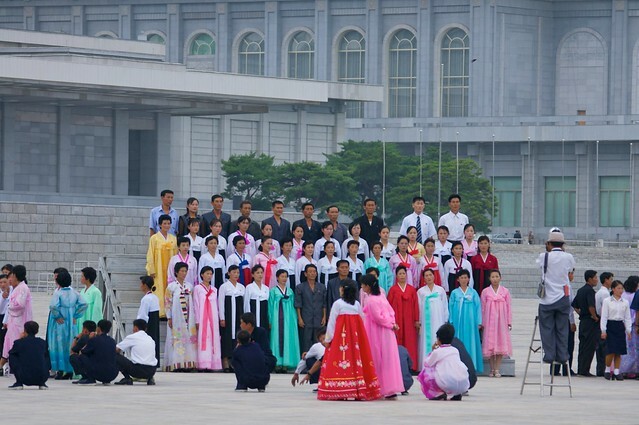 For insights and observations recorded from inside the DPRK, including the Kumsusan Memorial Palace of the Sun, check out our 2011 podcast. The North Korean Economy Watch also has an interesting look at the odd history of communist leader preservation.